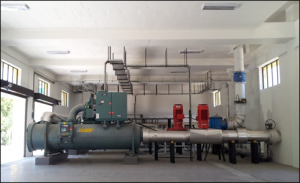 The existing chilled water plant had an installed plant capacity of 2200 TR comprising of 4 x 550 TR water cooled variable speed screw chillers. The chilled water circuit was a primary variable circuit with VFD driven vertical inline pumps for chilled water circulation. VFD driven vertical inline pumps were also used for condenser water circulation. The cooling tower fans also had VFDs. To reduce energy consumption, the plant operating team was operating the chiller at 10<sup>o</sup>C chilled water outlet with a 6<sup>0</sup> C DT. At this leaving temperature, however, some of the conditioned areas were outside the comfort band during peak seasons. The chiller plant was operating at 0.7 kW/TR on an annual basis including the pumps and cooling towers, which, considering the weather conditions of Chennai, was quite efficient. A load curve (Chart 1) was developed after detailed analysis of the cooling load profile to understand the loading on the existing chiller plant. The profile indicated a few occasions when the cooling demand peaked. It also showed a consistent base load of around 1200 TR. With new facilities being added and providing for additional capacity for future expansion, the projected demand of the new plant came up to 1500 TR. This would take the total installed capacity to 3700 TR and have a base load of 1500TR at all times. 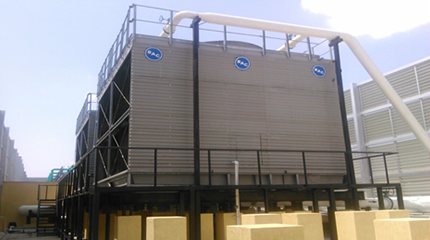 The existing chiller plant had variable speed compressors which made it ideal for handling the variable load. Considering space and available chiller capacities, we zeroed down on centrifugal chillers as the most viable option for the base load chiller plant. The chilled water temperature difference was maintained at 60 C to match the coil design conditions of the operating facility. The design chilled water leaving temperature was, however, fixed at 9oC in order to address the occasions when comfort conditions were not met. Typically IPLV/NPLV data is used to compare chiller performance. We used the campus weather station to get actual weather conditions for selecting the chillers. Being a base load application, the only expected variation was the variation in condenser water entering temperatures which in turn was related to the ambient wet bulb. The weather data was analyzed and a wet bulb v/s operating hours curve was developed to get an idea of the wet bulb behavior, and, therefore, the condenser water entering temperatures (Chart 2). Chiller part load data was obtained for the various condenser water entering temperatures and the projected annual power consumption of the chiller was estimated. Interestingly, while some chiller selections showed a low annual ikW/TR, the water side pressure drops on the evaporator and condenser sides were observed to be high. The annual power consumption analysis was extended to include the condenser water pumps, chilled water pumps and the cooling towers, so that the ikW/TR of the entire chiller plant could be obtained. Chiller selections were obtained from different manufacturer’s for various chiller arrangements. The power consumption of the chillers along with corresponding pumps and cooling tower power requirements were tabulated for all the options. A partial tabulation of selections provided by several manufacturers is indicated in Table 1. The series counter flow arrangement turned out to be the most efficient arrangement for our application. Though the chillers were supposed to operate at a constant load, the VFD on the compressor did give a benefit, even though marginal, when the wet bulb improved. The lowest annual specific chiller plant power, observed from the above table, was 0.52 kW/TR. Based on this, 2 x 750 TR chillers working on R 134a with VFD centrifugal compressors in a series counter flow arrangement were selected along with cross flow cooling towers and vertical inline chilled water and condenser water pumps. 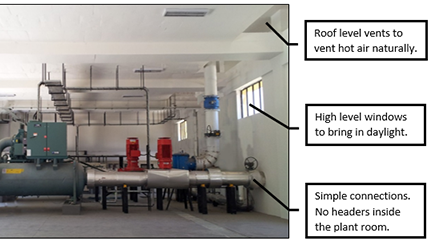 Power consumption of ventilation fans and lights were also considered as energy consumers for the plant room energy consumption calculation. The new chiller plant room was, therefore, designed to be ventilated without the use of mechanical ventilation while being sensitive to noise transmittance. Openings were sized and positioned to address ventilation requirements in the event of a refrigerant leak. Use of daylight was maximized by providing strategically located glass windows. These steps ensured that the net power consumption of the chiller plant room was further lowered over conventional chiller plants. Almost 45% of the total building energy use in a typical, efficiently designed and certified commercial office building, can be attributed to air-conditioning. Out of this, almost 60% is consumed at the chiller plant. The usual approach to designing chiller plants is to select the chillers, pumps and cooling towers based on their individual best efficiencies. 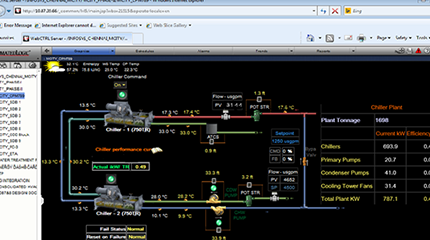 In this case, the chiller plant room was considered as an integrated entity and the design decisions were based on the overall system performance. This approach resulted in an improvement of about 30% over the already efficient existing chiller plant, translating to a net reduction of 9% on the overall building energy consumption. This case study demonstrated the large optimization opportunities that may be realized if chiller plants are designed as systems and not as a collection of individual equipment. Attention to architectural design of chiller plants can help in reducing the parasitic power consumption of chiller plants and making chiller plants livelier. This exercise also emphasizes the importance of metering to obtain data for optimization. Use of onsite weather data for weather and load analysis was critical to the optimization exercise. The chiller plant has been commissioned and is in operation for the last 9 months. The plant has an average specific power consumption of 0.49 kW/TR (See actual screenshot), 30% better than existing plant.